It’s a cheap solution made from Ikea parts for as low as $22. And you just put it on top of your existing desk. 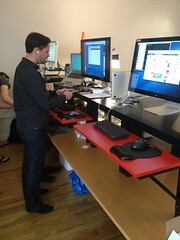 What do you want from a standing desk? There are really 2 parts of this: monitor height and keyboard height. The key thing is: you don’t want your monitor and keyboard to be on the same surface. You’ll get neck cramps, or cut off blood circulation to your fingers. Note: Make sure you get an 11 inch shelf + 11 inch brackets. This means you don’t need to screw in the shelf to the bracket (unless you want to). 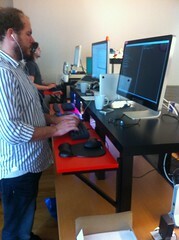 ^ The desks in action. As requested by Jonathan Wegener. Hundreds and hundreds of people have posted their build pictures on twitter, in the comments, and online. If you build it please share your pics! Consider getting yourself another Lack Side Table ($7.99) to double the surface area for your monitor. This option gives you space for a laptop stand. Also consider the Dioder LED set ($39.99) to add some color to your desk. It gives it that lowrider feel. 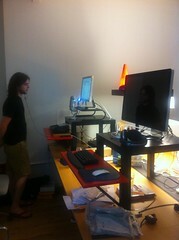 Though be wary, that the LED lights are more expensive than the entire standing desk. Have you built an amazing standing desk? Email me colin at customer dot io, or add it in the comments here. I want to see it. Have you made improvements on this design? Let me know too.